Spreadsheet Editor uses a tabbed interface where editing commands are grouped into tabs by functionality. Editor header displays the logo, menu tabs, spreadsheet name as well as three icons on the right that allow to set access rights, return to the Documents list, adjust View Settings and access the editor Advanced Settings. Top toolbar displays a set of editing commands depending on the selected menu tab. Currently, the following tabs are available: File, Home, Insert, Layout, Pivot Table, Collaboration, Plugins. Formula bar allows to enter and edit formulas or values in the cells. Formula bar displays the content of the currently selected cell. Status bar at the bottom of the editor window contains some navigation tools: sheet navigation buttons, sheet tabs, and zoom buttons. The Status bar also displays the number of filtered records if you apply a filter, or results of the automatic calculations if you select several cells containing data. Left sidebar contains icons that allow to use the Search and Replace tool, open the Comments and Chat panel, contact our support team and view the information about the program. Right sidebar allows to adjust additional parameters of different objects. When you select a particular object on a worksheet, the corresponding icon is activated at the right sidebar. Click this icon to expand the right sidebar. 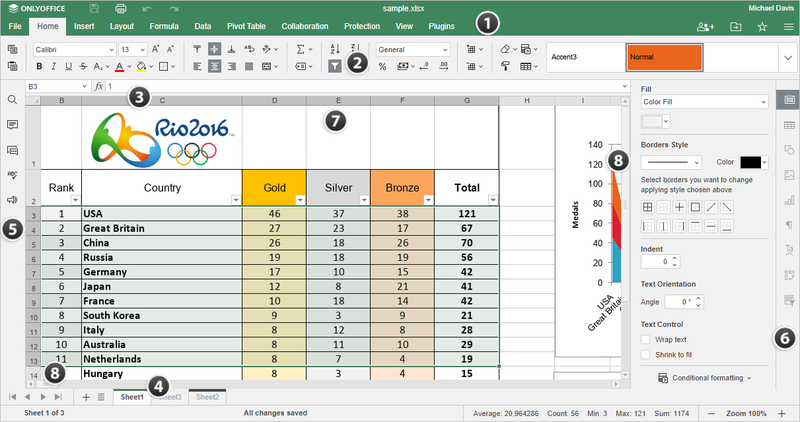 Working area allows to view spreadsheet content, enter and edit data. Horizontal and vertical Scroll bars allow to scroll up/down and left/right the current sheet.